Both summer/winter spreads and short term volatility have declined significantly this decade, choking off investment in new supply flexibility and causing owners of existing assets to question the value of spending significant renewal capex required to keep older assets open. In this article we explore what the loss of Rough means in a UK context as well as considering the potential market price impact. Investment in gas supply flexibility is supported by two key market price signals. Summer/winter price spreads drive investment in seasonal flexibility and short term (or prompt) price volatility drives investment in deliverability. Both price signals have declined significantly this decade choking off investment in new supply flexibility. As well as a dearth of new asset investment, owners of existing assets are unwilling to invest in renewal or life extension capex in existing assets. In March this year, Centrica announced a 25% reduction in available working volume at its Rough gas storage site. It appears that this capacity may now remain offline, given the challenging investment economics associated with rectifying Rough’s well integrity issues in the current weak spread environment. SSE’s 33% reduction of withdrawal capacity at its Hornsea site is another recent example of lost flexibility due to poor market returns. It is reasonable to hypothesise that the issues at Rough may not just be limited to a 25% capacity reduction. Over time, the incremental capex spend required to maintain the remaining working volume may present a similar challenge. In this article we explore what the loss of Rough means in a UK context as well as considering the potential market price impact. The loss of Rough is used as a case study in this article. A solution may be found for the current well issues, particularly if there is a timely recovery in seasonal spreads. However a similar logic applies to the retirement of other ageing flexible infrastructure in North West Europe (e.g. significant loss of Groningen flexibility). The full effective working volume of Rough, prior to the onset of well integrity issues, was around 3.8 bcm. This represents about 80% of the UK’s 4.7 bcm of total storage capacity working volume. In working volume terms Rough represents the lion’s share of UK storage capacity as illustrated in Chart 1 which shows UK storage utilisation across the most recent gas year. The restrictions announced by Centrica in Mar 2015 reduced Rough working volume by about 1 bcm. Compression has been maintained such that the maximum deliverability rate from Rough is unchanged. However the reduction in working gas means on average the UK market will have around 6 mcm/day less withdrawal capability across winter. The medium range storage facilities in Chart 1 are predominantly fast cycle salt cavern facilities (e.g. Aldborough & Holford). The configuration of these fast cycle assets is skewed towards fast injection & withdrawal rates. This means they pack much more punch in deliverability terms than Rough, but need to re-inject fairly regularly to maintain working gas levels. The short range stocks in Chart 1 consist of LNG tank storage assets. These play a relatively minor role in contributing to UK supply flexibility given low volumes and LNG supply chain logistical constraints that curtail flexibility (e.g. managing boil-off costs & the requirement to clear the tanks for additional cargoes). Chart 1 gives a sense of the significance of a scenario where Rough is phased out completely over time. When measured against current operational storage capacity, such an outcome would reduce UK working gas volume by around 80% and deliverability by around 25%. Storage is complimented by other sources of supply flexibility through the Norwegian pipeline network and UK interconnectors. But by any measure the loss of Rough is a big deal. Seasonal price spreads of 15-20 p/th are required to support investment in large scale seasonal storage (e.g. depleted offshore fields). 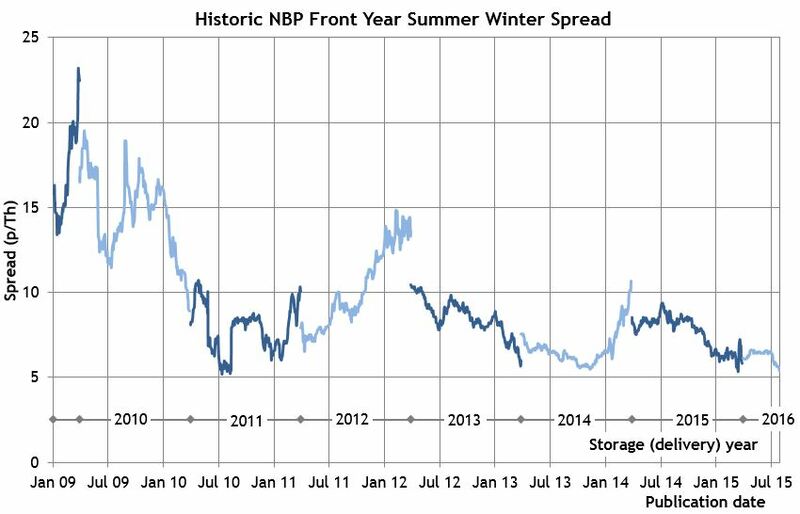 Yet the NBP summer/winter spread has steadily declined this decade to levels around 5 p/th today as shown in Chart 2. We have written previously about how this is driven by dynamics across the European gas market rather than factors that are specific to the UK market. Weak demand and an overhang of flexibility have crushed seasonal spreads across all European hubs, with little anticipation of a recovery priced into the forward market. Chart 3 shows a comparison of seasonal prices and price spreads at Europe’s two major hubs: TTF in dark blue and NBP in light blue. Chart 3 shows that NBP and TTF prices broadly converge on a forward basis over summer. But in winter periods, the UK NBP trades at a premium to attract the necessary imports from the Continent that are required to support seasonal demand. 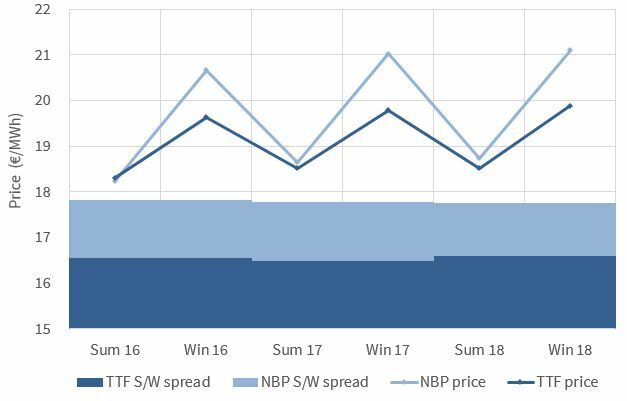 This means higher seasonal spreads at NBP (5 p/th or 2.40 €/MWh) than at TTF (2.9 p/th or 1.30 €/MWh). These dynamics do not necessarily hold on a within-year basis where prices can flip and spreads can rise as the result of specific supply & demand issues (as was seen in Summer 2014 when the renewed flow of LNG imports pushed summer prices down). The forward spreads in Chart 3 illustrate the issue that Centrica faces in investing life extension capex into the Rough facility. Selling seasonal storage capacity at 5 p/th (plus a small extrinsic value premium) is an uninspiring task. Yet the loss of Rough capacity and other European gas supply flexibility (e.g. loss of flex from the Groningen field in the Netherlands) does not appear to be reflected in market pricing. The only historical data point for loss of Rough capacity is the outage period following the fire in Feb 2006. Seasonal price spreads surged and spot volatility approached 300%. But it is difficult to compare market conditions in 2006 to today. Large volumes of flexible UK gas supply infrastructure were commissioned across the 2007-10 period (e.g. the Langeled pipeline, new fast cycle salt cavern capacity and a substantial increase in LNG regas capacity) which has to some extent reduced the UK’s dependence on Rough. Even so, the loss of Rough would certainly impact market pricing. The UK gas market would become much more dependent on importing flexibility (e.g. from Norway and through the interconnectors). This would mean more pronounced price signals to attract gas flows i.e. higher NBP spot volatility and some increase in seasonal spreads. The UK would also be much more susceptible to winter price shocks, with more frequent and prolonged price jumps likely required to attract incremental LNG imports. If Rough were to close it is not at all clear that market price signals would support investment in a large replacement seasonal storage facility. Seasonal price spreads at NBP are to a large extent driven by interconnection with the Continent which is oversupplied with seasonal flexibility. Instead peak deliverability constraints in the UK would drive much more pronounced prompt volatility. And the supply side response would likely come in the form of fast cycle not seasonal storage.